Julie Lapping Rivera works primarily in woodcut and collage. 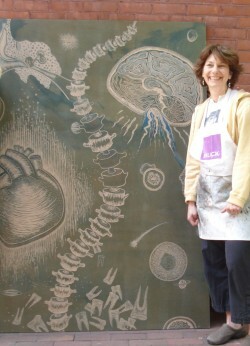 Her woodcuts are often woven in to her collage work, which includes a variety of printed, drawn and painted imagery. Julie received her BFA in Printmaking from the University of Massachusetts and her MFA in Painting from Pratt Institute. While living in Brooklyn, NY, Julie was awarded an Artist Fellowship and Artist in Residence grants from the New York Foundation for the Arts, as well as Arts in Education grants from the National Endowment for the Arts. Julie’s artist in residence experience in New York includes Pratt Institute, MOMA, Lincoln Center Institute and the Studio In A School Association. Since moving to Leverett, MA she has taught painting and drawing at the University of Hartford and currently teaches art in the Amherst Public Schools. Her work has been exhibited locally, nationally and internationally. Julie’s commitment to making the joy of art accessible to all is at the heart of her teaching. Please visit her website at www.lappingriver.com.